Proper watering is a priority! 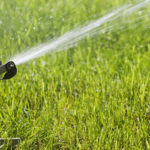 No fertilizer will perform if a lawn is drying out. 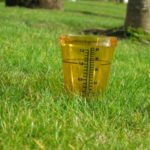 A lawn should receive 1 – 1 1/2 inches of water per week during the growing season. Determine this by placing a container in the sprinkler’s path and measure the amount of water accumulated in a given period of time. Water no more than 30 minutes in any given area. Repeating this procedure the same day will promote a deeply rooted plant. For best results, infrequent (usually every third or fourth day) and deep watering (to a depth of 6 inches) is esse ntial. Watering every day on an established lawn creates a shallow rooted plant that is less drought tolerant and more prone to disease development. 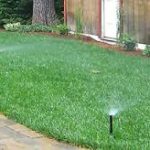 Early morning watering is advised to ensure good water pre ssure, allowing your sprinkler system to operate at its full potential. Less water is lost due to evaporation when the temperature is cooler. Also, wind movement is less prevalent in the early morning reducing off target or drift of water patterns. Avoid inefficient mid-day watering which results in water lost to evaporation in hot weather and off target drift due to wind.